One of the most common sights along Howe Sound, several species of marine birds are far less common along coastal areas than they once were. Bird count efforts are significant but do not cover the whole Sound. Although Karl Ricker is the lead author and compiled much of the information presented in this article, he did not see the final version due to a logistics issue. 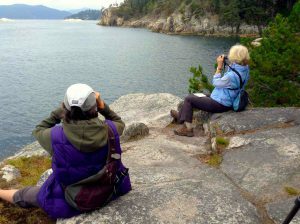 Lighthouse Park Preservation Society members conducting a monthly bird count in 2016. Photo: Suann Hosie. 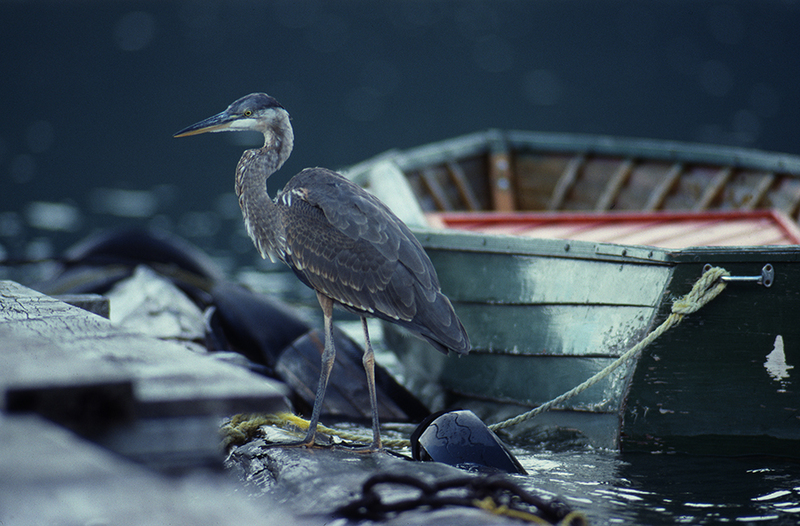 If you are out on the waters of Howe Sound, you are more likely to see and hear marine birds than any other wildlife. Marine birds animate Howe Sound with sounds of gulls, roosting cormorants at Horseshoe Bay, and great rafts of scoters and goldeneye that provide a magnificent shoreline spectacle during the winter months. Because marine birds are highly visible, changes in their populations are easier to observe than other species and they’ve become important indicators of environmental stress. But recent reviews of marine birds throughout the Strait of Georgia and Salish Sea have identified long term declines in a number of species that raise serious concerns. A recent assessment compares changes in marine bird counts in Howe Sound to changes noted in the Strait of Georgia and finds that changes in Howe Sound winter bird counts tend to parallel, with a few exceptions, the trends in nearby coastal marine birds as documented for the Strait of Georgia. Most of what we know about marine birds in Howe Sound comes from the observations of volunteers over many years. Volunteers conduct annual Christmas bird counts and monthly counts at several locations within Howe Sound. For example, in December 2015 and January 2016, groups in Lower Howe Sound (including parts of Bowen, Keats and Gambier Islands), Squamish (including the estuary and called Upper Howe Sound) and the Sunshine Coast (including the western shores of Howe Sound between Gibsons and Port Mellon) conducted counts as part of the Audubon Society’s Christmas Bird Count. The count in Lower Howe Sound involved 68 people and observed 78 species, among others, 1,071 surf scoters, 1,012 Barrow’s goldeneye, 104 double-crested cormorants, 30 marbled murrelets, and 14 horned grebes. Twenty-one observers with the Squamish Environment Society counted 72 species including 117 bufflehead, 4,217 glaucous-winged gulls, 36 great blue herons, 25 pelagic cormorants and 27 double-crested cormorants. Marine birds include shorebirds, seabirds, and seaducks. Seabirds, such as cormorants, gulls, guillemots, murres, and murrelets, spend most of their lives at sea but come ashore to breed, typically in colonies on islands. Sea ducks, such as goldeneyes, scoters, mergansers, harlequin ducks, and buffleheads are marine birds but typically breed inland. Shorebirds, such as sandpipers and plovers live along shorelines and forage on intertidal invertebrates. 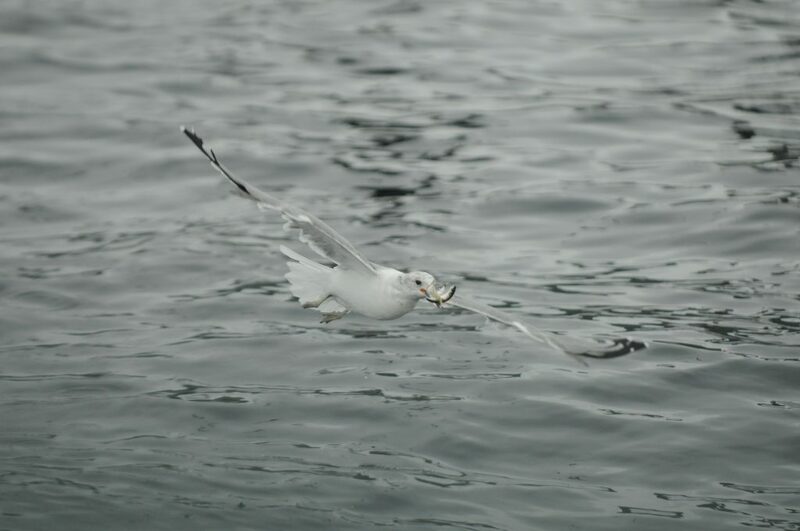 Marine birds play a variety of roles in the Howe Sound ecosystem as carnivore hunters of fish and invertebrates, herbivore grazers, scavengers of carrion, and as prey. The overall number of marine bird species in Howe Sound is about 130, and Christmas bird surveys typically observe about 11,000 individual marine birds representing 73 different species. About 23 species breed or are suspected to breed in Howe Sound. Several sites in Howe Sound are especially important for marine birds. Christie Islet is a federally listed Migratory Bird Sanctuary, the only site in the Vancouver area where substantial numbers of seabirds nest, including pelagic cormorants, double-crested cormorants, and glaucous-winged gulls. The lower reaches of the Squamish River, its tributaries, and estuary are designated an Important Bird Area by BirdLife International. This area is deemed globally significant for Bald Eagles that congregate in winter, nationally significant for Great Blue Heron, and breeding grounds for several species of ducks and geese. Old growth forests are critical nesting habitat for marbled murrelets, and the murrelet populations on Howe Sound likely reflect access to such nearby forests on the Sunshine Coast, and perhaps Gambier Island and the North Shore Mountains. – content reproduced with permission from “Where rivers, mountains and people meet,” Squamish Líl’wat Cultural Centre. A more comprehensive report on marine birds in Howe Sound has been produced by the senior author. Seasonal abundance checklists provide information on the abundance of individual species throughout the year, whether breeding occurs locally, and the habitats where each species is found. Seasonal abundance checklists are qualitative and different observers over time can gain different impressions of abundance. Such local checklists have been produced for the Squamish Estuary, the upper Howe Sound Region and Squamish River Watershed, and the Sunshine Coast, including the shorelines of West Howe Sound between Gibsons and Port Mellon. The seasonal abundance of marine birds is well established in Upper Howe Sound based on monthly bird counts since the early 1990s in the Squamish estuary. Approximately 130 different marine bird species use Howe Sound. Bertram’s report on the Strait of Georgia (SoG) showed statistically significant changes for a number of marine bird species in Christmas Bird Counts between 1978 and 2008. The double-crested cormorant (up 171 percent in SoG) breeds in Howe Sound and is commonly observed. The Canada goose (up 114 percent) also breeds in Howe Sound and is listed as common in Upper Howe Sound. Species that experienced the most precipitous declines in the SoG study include the western grebe (down 86 percent), the common murre (down 84 percent), marbled murrelet (down 69 percent), canvasback (down 63 percent), the greater scaup and lesser scaup (analyzed together and down 51 percent), the black scoter (down 47 percent) and the glaucous-winged gull (down 37 percent). The direction and significance of trends in the SoG are corroborated for the Canada goose, the western grebe, canvasback, great and lesser scaups, the black scoter and the glaucous-winged gull by Crewe et al.’s analysis of Coastal Waterbird Surveys. The western grebe and common murre are uncommon at best in Howe Sound, while the marbled murrelet is fairly common along the Sunshine Coast and West Howe Sound and likely breeds in the limited old-growth forest in the region. Scaups are ‘fairly common’ in Upper Howe Sound in the spring, but uncommon at other times and elsewhere in the Sound. The Glaucous-winged gull likely breeds in Howe Sound and is commonly observed year round in both Upper Howe Sound and Sunshine Coast. 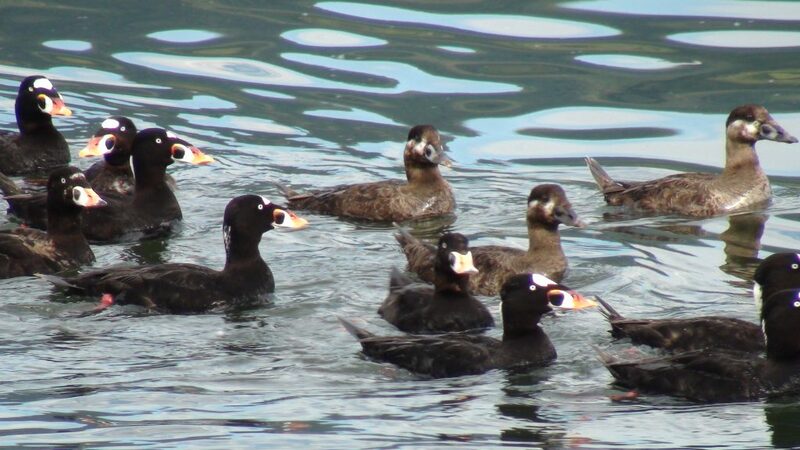 The black scoter, a diving duck/sea duck that feeds on herring spawn among other things, generally uncommon in the Strait of Georgia, is considered fairly common along the Sunshine Coast and West Howe Sound, except in summer when it is not observed. Locally, the decline in the Pacific herring is identified as a reason for declines in many fish-eating marine bird species, and Bertram supports this view in his discussion on the Strait of Georgia, although he also highlights competition with seals, gulls, and other species for herring. The seal population in Howe Sound is very robust, especially near the mouth of the Squamish River when fish are present. Other factors discussed are human threats including the herring fishery, habitat alienation by a variety of man-made expansions, toxic compounds including creosoted pilings, bilge discharge and spills, bird harvesting (which is still legal), impacts from climate change, and the overbearing presence of dogs in many shoreline habitats. Bird watching is one of the fastest growing hobbies in North America. Whether you are a beginner or advanced, you can join one of the annual Christmas Bird Counts that occur in West Vancouver, Bowen Island, Squamish, and the Sunshine Coast, or the more frequent monthly bird counts with the Squamish Environment Society or Lighthouse Park Preservation Society. It is a great way to learn from people who know more than you. If you are a knowledgeable birder, you can submit your observations directly through eBird, the online repository for worldwide bird observations managed by the Cornell Lab of Ornithology. Any unusual sightings require an accompanying photograph to be accepted by eBird. Keep your practices friendly to marine birds. During the spring and summer, stay away from offshore rocks that are nesting sites for oystercatchers, gulls, and cormorants. Never take your dog to these islands. During the winter, don’t disturb flocks of winter birds along the coastline. You may disrupt their feeding or resting and cause them to waste valuable energy. Collect lost nets and traps and plastics on beaches that might trap or kill birds. Continue to support and facilitate the education, monitoring, and restoration activities of local groups in Howe Sound. Provide funding assistance and partnership opportunities where feasible. Increase monitoring and enforcement of illegal bird harvesting. Legally recognize and strictly regulate Important Bird Areas as Protected Areas, especially in IBAs that do not have established legal protection (e.g., National and Provincial Parks). Where this is not feasible, consider conservation easements and agreements, private land stewardship, and land acquisition to ensure protection. Explore the possibility of increasing the size of the Skwelwil’em Wildlife Management Area or Nature Trust Conservation Area, or create more Wildlife Management Areas to increase protection.